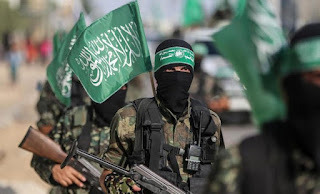 Operatives from across Hamas' military wing — including air, land, and sea units — participated in the military exercises, demonstrating the terrorist organization's efforts to improve interoperability among its various components. Fighters practiced attacking armored vehicles depicting IDF tanks, while test firing missiles into the Mediterranean Sea. Hamas also deployed drones with "Ababil" markings — one of Iran's signature unmanned aerial vehicles. Climbing on my soapbox so bear with me. This is where the SOCOM/Small Wars/Terrorism forever got it so wrong. Quite honestly SOCOM and the Small Wars crowd are building forces to deal with terror cells in Western Countries. A SEAL Platoon, or a Special Forces A-Team can successfully engage up to probably 50 man (depending on how they're equipped) terror formations. SOCOM along with their sycophants in the Marine Corps are trying to make a terror/small wars fight part of the effort to block and eventually engage China while continuing the fight they're in. Terrorist now are challenging AND BEATING nation state armies across the board. Hell they're built like conventional military forces! The future that we should see is MARSOC and Army Rangers take the lead in the fight against these modern day terrorist and deploy in at least COMPANY SIZED formations and in some cases larger. We've already seen fights where a Ranger or MARSOC Battalion would be better suited to the fight than SEAL or Green Berets. If you don't believe me then do a solid search on Hamas' order of battle. You'll see that they now operate a force that has every tool a nation state army has. Plus there is the terrible truth that SOCOM fan boys will never admit but has been known for DECADES. Special Operations Forces are vulnerable to conventional forces. Side note. Israel is screwed. If even a quarter of that force is fanatical and if they can properly martial them, they can't destroy the Jewish state but they can cause enough mayhem to make the 2015 French Terror Attacks look like a nice night out.